The proposed design is not intended to be seen just as a normal bridge or a path which is just the shortest link.The existing structure fulfills this requirement well enough. In this case it’s character and essence would be deeply rooted in making the city center of Atlanta more accessible and user friendly to the community and attractive to guests passing through. Because modern monuments don’t need to be just statues.They can be structures,areas , surfaces or places strengthening interaction, focused on performance in many ways, on what they can give in return to the Eco-system, nature and society due to claiming of a piece of land. Hence the bridge design does not have to derive from aesthetics, being a sculptural form what would not bring any solutions for the issues of those who live within and visit Atlanta using the connections above the connector via car, bicycle, transit, and pedestrian movement systems.It can be a performative approach showcased in this parametric bridge design proposal which has the potential to be easily tailored to different needs and conditions including financial ones. 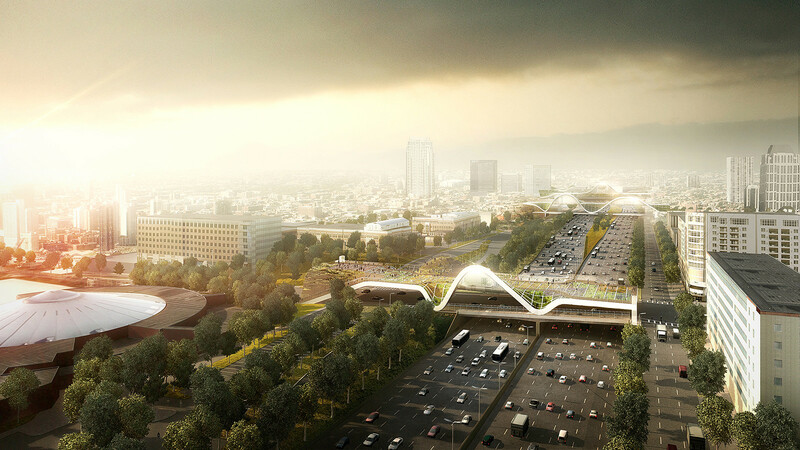 The outcome is a 35 meters wide and 144 meters long platform which would hover and stretch beyond the focus area to create a seamless connection with the land and improve pedestrian connections. 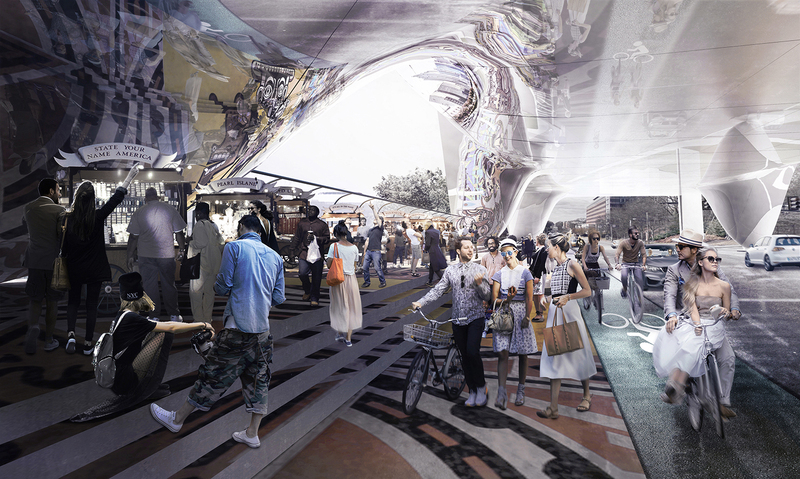 The structure would form a roof allowing to shade specific areas positioned on an easy promenade featuring social active functions such as meeting points or market places. The extended pavement would still be giving necessary clearance for each type of traffic,where cars,bicycles would have it’s own lane, designed to changing vehicular needs. 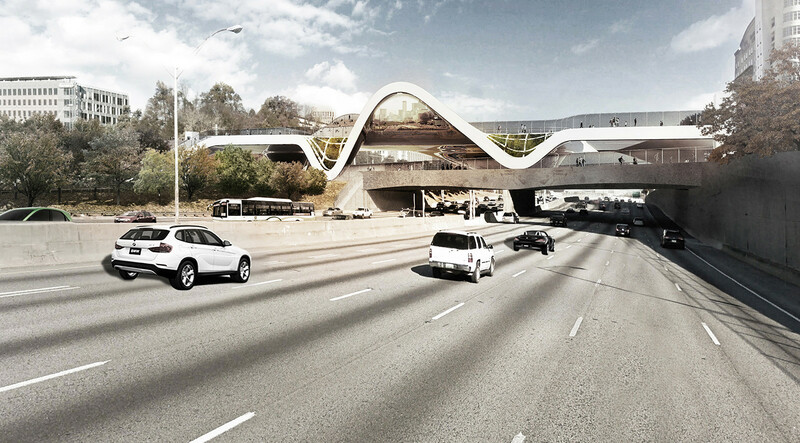 While the bridge would be a functional connector it’s character and essence would be defined by nature and the Atlanta City itself. 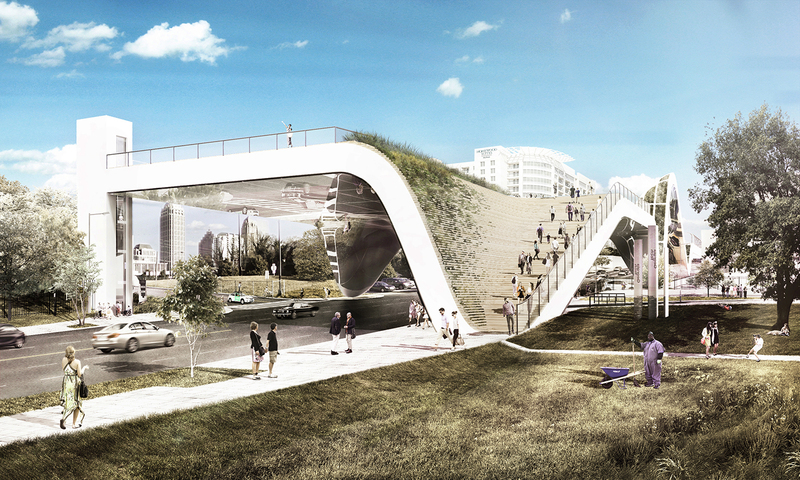 10th Street Bridge would concentrate on creating a positive impact offering a varied program and presenting a new neighborhood park which would be a retreat for residents and a territory to explore for motorists who travel along the roadway without stopping. 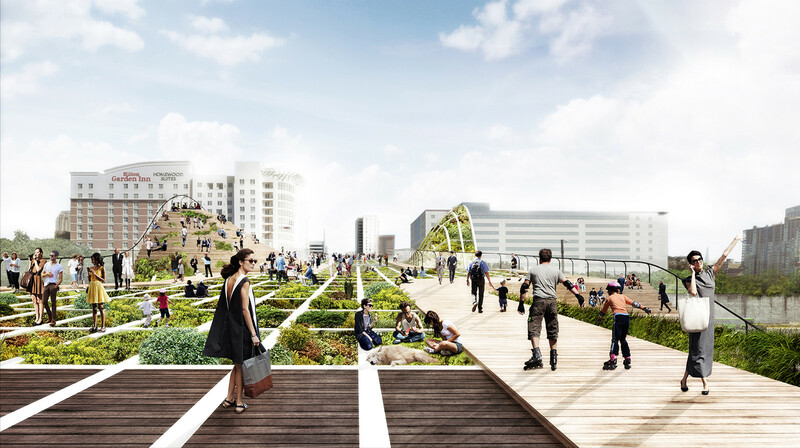 The top part of the strip would be entirely devoted to pedestrians,green areas and urban farming making it a pleasant destination for contemplation for some and a desirable urban place for other individuals to interact. 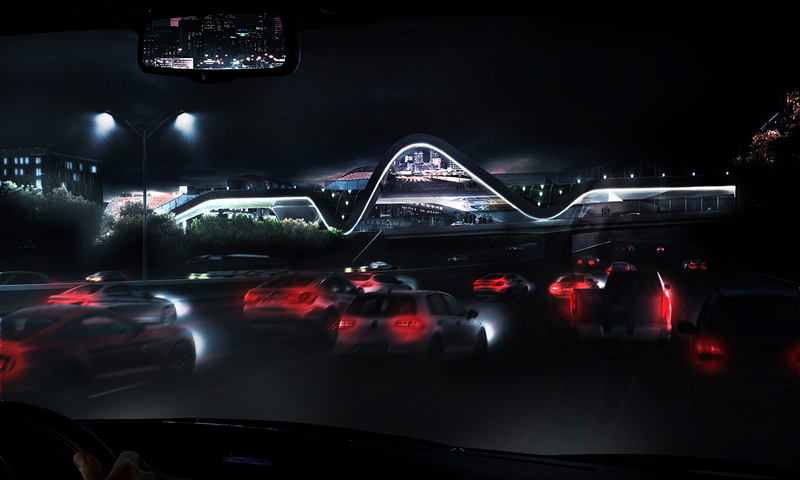 The visual appearance of the Connector and identity of Atlanta as perceived by residents and visitors would be additionally improved through design to create a positive direct visual impact on the observers. 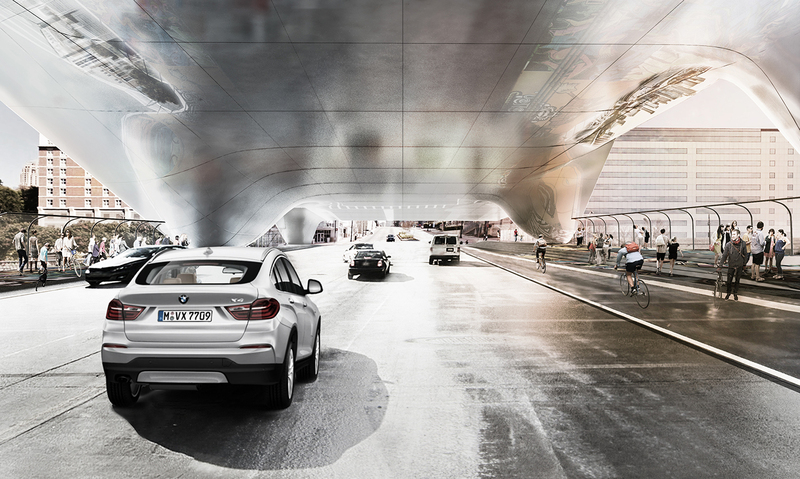 The underside would be covered with a mirror surface which would reflect the ambient. Modifications applied on each side of the lifted surface would be positioned in specific points oriented towards interesting and visually appealing places in the city and the nearest surrounding.Recognizing that the appearance of the Interstate reflects on the whole City this would bring a positive, memorable experience not only for pedestrians and bikers using the bridge but also for motorist who frequently use the I-75/85 Connector as a corridor of Atlanta. 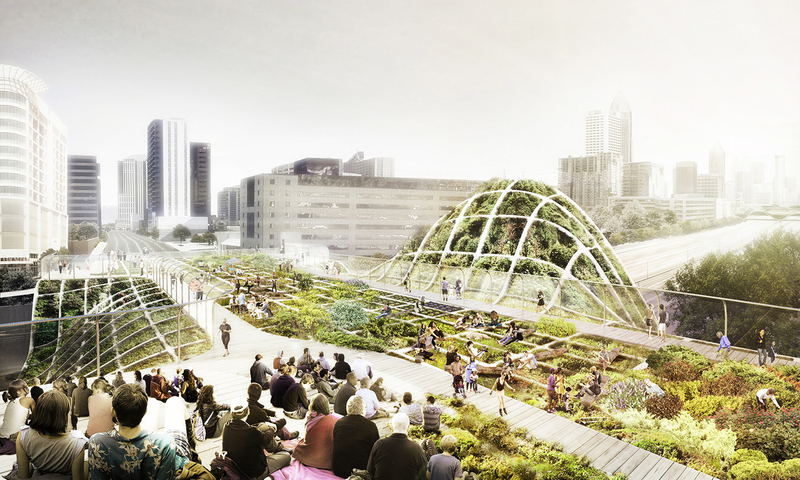 This vision would be also strongly focused on environmental design featuring recyclable and reclaimed materials as building elements,the whole roof area devoted to rainwater harvesting and an innovative approach to mitigate the corridor’s environmental impact with the practical use of natural ventilation.This would be achieved through additional changes applied on the bridge edges which would operate as intakes where wind channeled to pass through plants and trees would help to purify the city air. To additionally improve not only the visual appearance but also the human experience the top part would be functionally reprogrammable due to the prefabricated modular character of the design.